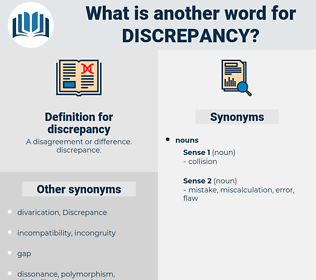 What is another word for discrepancy? A disagreement or difference. discrepance. divides, Unconformity, chasm, inadequacy, contrast, contrasts, disharmony, lag, inequality, paradox, deficiency, disequilibrium, derogation, aberration, shortfall, diversity, distortion, discord, gap, dichotomy, rift, non-compliance, asymmetry, heterogeneity, shortcoming, split, defect, margin, dissatisfaction, shift. disparity, contradiction, mismatch, disproportion, discordance, anomaly, differentiation, disconnect, abnormality, dispute, dissent, dissonance, irregularity, incompatibility, incoherence, disjunction, disconnection, time-lag, variability, quarrel, lapse, inequity, gulf, controversy, clash, differential, distinctiveness. concordance, accord, consistency, parity, likeness, concurrence, similarity, harmony, alikeness, sameness, agreement. homogeneousness, congruity, accordance, resemblance, equivalence, parallelism, equality, Equivalency, analogy, conformity, identity, identicalness, community, consonance, homogeneity, uniformity, similitude, unity. There is a discrepancy, it will be observed, between the Gazette and the autobiography, in regard to the name and tribe of the father of Mr. Jones' Indian bride. Such a discrepancy in judgment must come from a lack of acquaintance with Jones or a lack of knowledge of what constitutes a good man or a rascal.